S. D. Peroukidis, A. G. Vanakaras and D. J. Photinos, J. Mat. Chem., 20, 10495-10502, (2010). Abstract. A theoretical model of shape-anisometric particles embedded in a cubic lattice is formulated for binary mixtures combining rod-like, plate-like and spherical particles. The model aims at providing a tool for the prediction and interpretation of complex phase behavior in a variety of liquid crystalline colloids, biological and macromolecular systems. Introducing just repulsive interactions among the particles, a rich variety of phase structures and multiphasic equilibria is obtained, including isotropic, nematic, lamellar and columnar phases, demixing into phases of the same or different symmetries and structural microsegregation of the different species of the mixture within the same phase. S. Droulias, A.G. Vanakaras, D.J. Photinos, Liquid Crystals, 37:6, 969-976, (2010). Abstract: We demonstrate by computer experiments that the spontaneous formation of two-dimensional regularly patterned molecular networks containing voids may be an entirely entropy-driven process. On the basis of a simple model of core−(soft) shell half-disk-shaped particles, we show that, even without the mediation of any attractive interparticle forces, such particles self-organize to stable and macroscopically ordered patterns with regularly distributed voids. The morphology of these supramolecular porous motifs depends critically on the size of the core relative to the coronal halo. The reverse engineering analysis of these precise two-dimensional supramolecular porous templates suggests molecular-shape complementarity and polyphilicity as key design parameters for the bottom-up engineering of such functional substrates. Thermotropic biaxial liquid crystals: Spontaneous or field stabilized? A.G. Vanakaras and D.J. Photinos, J. Chem. Phys., 128, 154512 (2008). Abstract: An intermediate nematic phase is proposed for the interpretation of recent experimental results on phase biaxiality in bent-core nematic liquid crystals. The phase is macroscopically uniaxial but has microscopic biaxial, and possibly polar, domains. 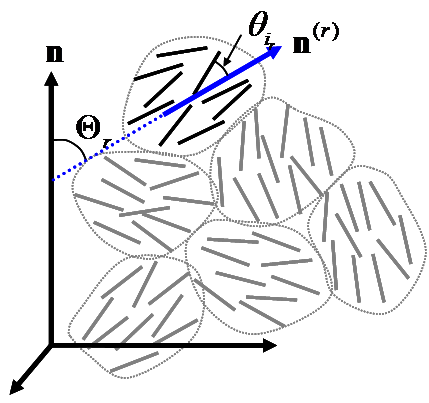 Under the action of an electric field, the phase acquires macroscopic biaxial ordering resulting from the collective alignment of the domains. A phenomenological theory is developed for the molecular order in this phase and for its transitions to purely uniaxial and to spontaneously biaxial nematic phases. Theory and simulation of biaxial nematic and orthogonal smectic phases formed by mixtures of board-like molecules, A. G. Vanakaras, M. A. Bates and D. J. Photinos, Phys. Chem. Chem. Phys. 5(17), 3700 (2003). The phase behavior of a binary mixture of rodlike and disclike mesogens: Monte Carlo simulation, theory, and experiment, A. Galindo, A. J. Haslam, S. Varga, G. Jackson, A. G. Vanakaras, D. J. Photinos and D. A. Dunmur, J. Chem. Phys. 119(10), 5216 (2003). On the Molecular requirements for the stabilization of thermotropic Biaxial ordering in Rod-Plate nematics, A. G. Vanakaras, A. F. Terzis and D.J. Photinos, Molec.Cryst. Liq. Cryst., 362, 67-78 (2001). Theory of biaxial nematic ordering in rod-disc mixtures revisited, A. G. Vanakaras and D.J. Photinos, Molec.Cryst. Liq. Cryst., 299, 65-71 (1997). Hydrogen bonding and phase biaxiality in nematic rod-plate mixtures, A. G. Vanakaras, S. C. McGrother, G. Jackson and D. J. Photinos, Molec.Cryst. Liq. Cryst., 323, 199 (1998). S.D. Peroukidis, A.G. Vanakaras and D.J. Photinos, J. Phys. Chem. B , 112(40), 12761-12767 (2008). , S. D. Peroukidis, A. G. Vanakaras and D. J. Photinos, J. Chem. Phys., 123, 164904 (2005). , S. D. Peroukidis , A. G. Vanakaras and D. J. Photinos, Soft Matter, 4, 493-499 (2008). A. G. Vanakaras and D. J. Photinos, J. Mater. Chem. 15, 2002-2012 (2005). S.D. Peroukidis, A.G. Vanakaras and D. J. Photinos, Soft Matter, 4, 493-499 (2008). Abstract: A molecular model of cubic building blocks is used to describe the mesomorphism of conical fullerenomesogens. Calculations based on density functional molecular theory and on Monte Carlo computer simulations give qualitatively similar results that are also in good agreement with the experimentally observed mesomorphic behaviour. The columnar and lamellar mesophases obtained are non-polar, and their relative stability is controlled by a single model parameter representing the softness of the repulsive interactions among the building blocks of the conical molecules.